The Assembly of the Sacred Wheel is astrologically based in its structure. There are twelve Circles within the Assembly, one for each of the signs. Each Circle contains within it four Covens. Each Coven bears one of the elemental tools (east/air/sword, south/fire/staff, west/water/chalice, north/earth/pentacle). Coven of the Rowan Star was the second Coven to come into existance within the Assembly. It is part of the first Circle, the Circle of Pisces. The first Coven, Keepers of the Holly Chalice, is the West or Water Coven of the Circle. The first Coven of a Circle is always of the element that matches the sign of the Circle (Pisces = Water = West). The remaining Covens then come into being clockwise around the Circle (Pisces = West to North to East to South). Each coven holds stewardship over the tool of its element. 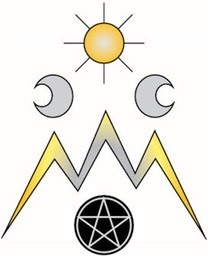 That tool is the center of the Coven's group mind and the repository of all of the wisdom, experiences and information that the group gathers during its existance. Each member of the group adds to the energy and 'intellegence' of the group mind over time, feeding and shaping it. Because of its importance to the group over time, and its special relationship with the other tools within the Circle of which it is part, it must be created from scratch, with singular focus and intent. The tool never existed except as part of the Circle. Our sacred tool, the Pentacle, was created in 1994. It has three parts created from three different expressions of Earth; wood, metal, and gem. The base is made from Rowan wood. Rowan is a magickal wood with a voice that calls to the spirit realms. The pentacle inlay is made from Silver metal. Containing the power of the Moon, Silver connects one with the astral. Set in the center is an Emerald gem. Enhancing psychic ability, raising consciousness, and attaining balance are just a few of the qualities provided by Emerald. The Rowan Pentacle was created by a variety of artisans. The wood, collected in Wilmington, DE from ancient rowan that had been cut down, was crafted by a woodworker in Pennsylvania. He allowed several of the coven members to be present and perform a Rite while he was carving out the groves for the silver. That silver inlay work was done by a jeweler in Wilmington, DE, who also set our emerald at a later date. The silver was obtained though a jewelry supply house and the emerald was ordered through a favorite shop in Rehoboth Beach, DE. At each step of the process the materials were consecrated, and after each piece was added a working was done to make sure that all the pieces were magickally integrated. It took time, effort, and extreme patience to bring our sacred tool into being. The results were well worth it. And the group mind within grows along the path with the entire Coven, the Circle, and the entire Assembly.